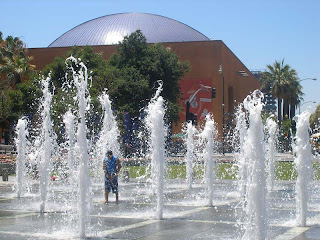 Years ago San Jose, CA had the reputation of being the San Francisco Bay Area's very poor cousin. Well, the cousin won the lottery. Silicon Valley happened and the rest is history. Civic-minded investors poured a bunch of money into the area and it shows. I was recently traveling and spent time at the San Jose, California McEnery Convention Center (150 West San Carlos St. San Jose, CA 95113). A clean and sleek neighborhood of bistros, fountains, coffee houses and museums begins within 100 feet of the McEnery Convention Center. 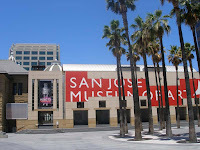 I had a couple of free hours, so I first visited the San Jose Museum of Art. The exhibit Robots: Evolution of a Cultural Icon was fun. It seemed fitting to have this type of exhibit in Silicon Valley and it was an interesting counterpoint to my visit to The Tech Museum of Innovation nearby. One of my favorite pieces in the Robots: Evolution of a Cultural Icon was Michael Salter's piece, a twenty feet tall robot sculpture made out of styrofoam computer packing material titled, Giant Styro. Salter made the piece specifically for the space. It was whimsical to look at, yet at the same time, realizing just how many styrofoam packing materials are sent all over the world with every computer purchase and the subsequent environmental impact of the computer, it had a bit of a dark edge (maybe medium-gray is a better description). The exhibit covered mostly the playful and toy-like friendly images of robots that are brought to mind in short stories by Isaac Asimov. There wasn't much in this exhibit to do with the postmodern ironic/destructive robot images from movies like Terminator and Robo Cop. All in all -- I like that the San Jose Art Museum and The Tech Museum of Innovation are so close to each other. In a symbolic way it's as though the civic minded citizens of San Jose are reminding all of us that art and science need each other to create the kind of cities we will want to live in. 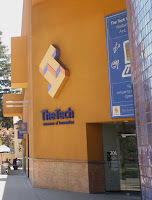 And if you have more time, there's the cozy San Jose Museum of Quilts and Textiles to visit just a few blocks away. I love painting commissions to commemorate a happy occasion or life experience. This morning I finished this 22" x 30" painting for a couple who are marrying and wanted an image for their wedding announcements (and for their wall). They asked for the image in my Paint Happy style and had a few ideas for the image. They love bright colors (sent me a list of the wedding colors) and they sent me photos of their wedding clothes along with a photo of the lighthouse in the San Juan Islands where the service would be. This was a very fun piece to create. The groom is steadfast and loving, supporting the heart he and the bride embrace. 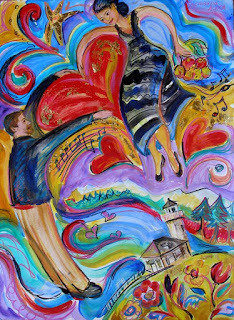 She is happy and sanguine, serenely floating with flowers, music and hearts. Together they are flying over the sea surrounding the lighthouse. The painting is 22" x 30", Acrylic and Hard Pastel with 22kt. gold leaf on 100% rag paper. If you'd like to commission a painting, contact me for details. Do you need some SPF for your home? Cutting down on sun exposure in your home will save you air cooling costs and UV damage to your decor and furnishings. Not only can you create some SPF, you can add an outdoor living space at the same time (or make a hot, sun-soaked deck liveable). Though there are many ways to add shade and outdoor living space, most solutions require a contractor or a very energetic Do-it-Yourselfer. My husband, Randall Barna and I discovered Shade Sails (originally an Aussie import) and use them with great results. (We're building a cool looking garden structure -- when we're done I'll post photos). 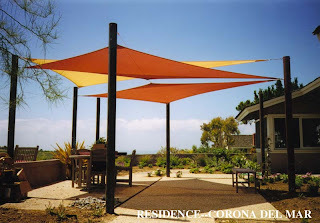 Available in a variety of colors and simple rectilinear shapes, Shade Sails can create an instant outdoor living area. Shade Sails are an inexpensive and stylish (I love it when those two concepts go together) addition to your home. Set up some furniture and a few potted plants under your Shade Sails and you'll be spending more time outdoors. Dear Cristina, The days are getting warmer. I have a nice backyard, but with just a concrete paver patio and grass, it isn’t very cozy. I’m ready to create an outdoor living space in my backyard that invites my friends and family to sit and relax. I also want something I can put together quickly. Any ideas? 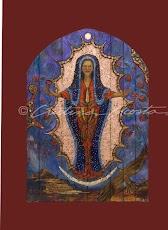 Rosita R.
It is easier than you think to make a great outdoor space. Outdoor living is the big trend in home décor and the new crop of products are stylish and durable. Because you already have a deck or patio and landscaping, you have a good foundation for your outdoor living area. Shelter from the sun and stylish comfortable furnishings will give you the sense of gaining more square footage without a home remodel. If you’re renting or on the move, the ideas I’m giving you will fit into either a t emporary location or your permanent home. Think of these ideas as layers. The first layer is your existing patio, the second layer is seating and the third layer is shade. Lets start with a layer of SPF for you and your furnishings. A little shade goes a long way to keeping both looking younger, longer! Pavilions and shade sails will shelter you from the sun with style. 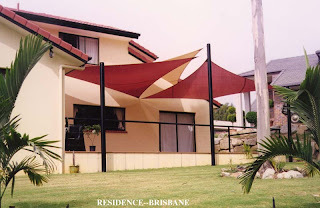 Shade sails from ShadeSails.com are a stylish and simple idea that the sun-drenched Australians have perfected. Simple geometric shapes of rectangles and squares with gently curved edges in a selection of colored polyethylene knit are striking modern accents to most any architecture. Pulled tight and attached to the home’s structure, or sturdy posts, they withstand most weather (except snow loads) for years. You’ll love the colors and the prices. Most ready-made designs are only about $100 dollars. At that price you can afford to layer a few in the same or different colors. Pavilions (or cabanas) like this example from Tropitone are lush Sunbrella™ fabric rooms suspended from a wood or aluminum frame. Curtains complete the look and give you some flexibility for privacy or sun shading. You can take them anywhere! Set up a table and chairs or comfy seating that encourages a chat and you are ready to settle into the perfect setup for seasonal living. . . . . Contact Latina Style Magazine for more. Thanks to www.ShadeSails.com for the photos. My uber creative friend, Judy Shasek has developed a new product that will get everyone moving, and I'm excited to share it with you. It's a computer mouse pad that you can stand on. You don't have to use it all day long, just when you want to burn a few calories. If you slip in a game of solitaire (or other computer game) during the work day, use the FootPOWR mouse pad and you'll be up and moving. And if you have kids, the FootPOWR mouse will get them active while they game or even do their homework. ". . . office workers burned on average 180 more calories per hour while using FootPOWR pads for casual games like Bejeweled, AstroPop and Bookworm Adventure than they did while sitting and playing. The gamers wore heart rate monitors and the calorie burn was estimated based on the size of the person and the difference in heart rate measured FootGaming or sitting and playing the same game. There are likely other benefits, too. Research suggests that employees who are more active are often more engaged, healthier -- and happier. Activity helps increase energy and can improve concentration and focus -- important attributes for the office. In theory, FootGaming could also help reduce office stress, since numerous studies show the stress-reduction benefits of walking. If FootGaming can result in employees who need fewer trips to the doctor, the addition of FootGaming breaks throughout the work day could potentially pay for themselves. The idea of moving while doing mental work is not new. It's a skill that early humans had to master to survive. Recent books by Dr. John Ratey, SPARK, and Dr. John Medina, BRAIN RULES, explore that fact that for best brain function, humans are meant to move. If you’d like to learn more about FootGaming at work or at home, please e-mail us for a personal consultation at no charge. I believe that good health is the foundation for a productive life. Nutrition and movement are the keys, and I'm excited to share with you creative solutions that enable you to make good health the easy choice in your day. You can learn more about Judy Shasek. Judy is also my surf buddy. 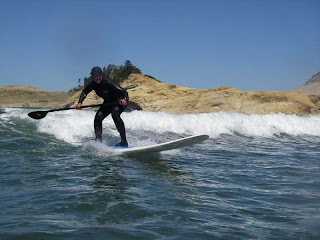 Here's a photo of her catching a wave on her Stand Up Paddle board on the Oregon Coast. 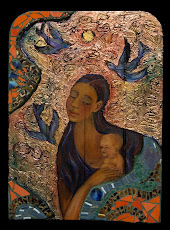 The Onda Gallery in Lake Oswego, Oregon is devoted to sustainability and fair trade. 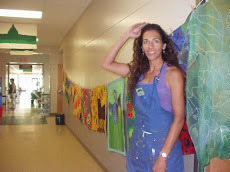 The August exhibit, "Paint Happy and Human Adventure" features J.D. Bump and me. J.D. 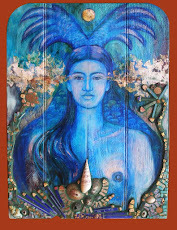 is a multi-talented artist who is both a sculptor and painter. He's also honing the art of travel, and chronicles his many trips with sketches and paintings. 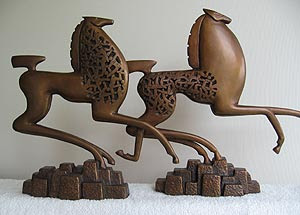 I especially love the sensual shapes and textures of his sculptures. 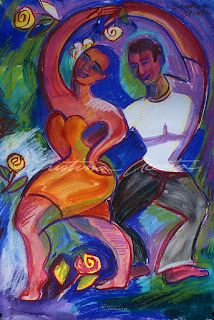 Lush bright colors and playful rhythms describe my Paint Happy series. Named after my book, Paint Happy, this is my series of images that focus on those moments in life that evoke happiness and contentment. Pablo Merlo Flores and his staff invite you to visit the gallery. Gallery Opening: First Friday, August 1, 2008 First Friday evening the gallery is open to the public. Duck Pond Cellar will be the wine tasting host. 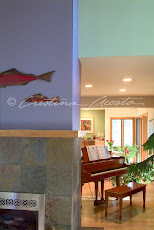 Color consulting clients often have questions about low-VOC (Volatile Organic Compounds) paints. VOCs in paints are usually chemicals including formaldehyde or benzene, etc. On a planetary level these types of chemicals are linked to ozone depletion and water pollution. On a personal level, these chemicals are linked to asthma attacks, headaches, irritation to the eyes, nose or throat, cancer, nervous system disorders and more. Sounds scary -- and it can be, which is the reason low-VOC paints are popular and no-VOC paints are now getting more interest. Clients are usually all for the idea of no-VOC paints until they see the difference in price between low and no-VOC. Here's what I usually tell them. Most of the VOC's are released as the paint dries (cures) and are gone within days. Paint has a curing time which can be from a few days to as long as a week depending upon atmospheric conditions such as humidity. 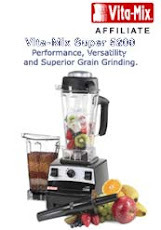 The highest amount of VOC's are in the colorant. A light color in most brands will have the lowest of VOC's. One brand, Benjamin Moore Aura paint has acrylicized colorants (they own the patented process). What that means to you is that the darkest colors have no VOC, and that the paint is very durable and covers in one to two coats for even the darkest color. 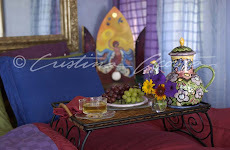 You can order any of the over 3,500 Benjamin Moore colors in the Aura paint, so color choices are not a problem. 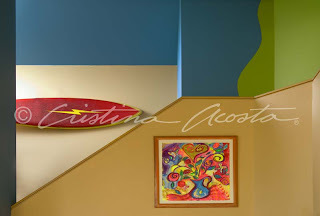 I do still hand paint the walls of my home so that I can personally test a paint. As a fine artist, my standards for a paint are high. My current favorite for coverage, durability, ease of application (feel when wet), color choices and no VOC's is the Benjamin Moore Aura line. It's also expensive, but I think a good investment (especially factoring in coverage coats for dark colors). I'm not saying that Aura is the only paint to use, just that when I personally paint a wall, I love it. I do still use and specify other lines including Sherwin Williams and Pittsburgh. Smaller or more regional lines of paint such as Yolo Colorhouse and Divine are also very good paints. Interested in Color Consulting? Get my free E-book detailing my services. Black rubber tires sized for all manner of car, truck, bike and other conveyances are the medium artist Chakaia Booker has worked in almost exclusively since the early 1990's. This past weekend I visited the Kemper Museum of Contemporary Art in Kansas City, Missouri and saw Booker's exhibit. The first thing I noticed were the sensual textures and engaging shapes of her sculptures along with the strong scent of industrial rubber tires. I don't particularly like the scent, so the combination of the odor with the pleasing visuals was interesting. Overall the feeling of Booker's work for me is sensual, thoughtful, loving and sometimes (just a little) disgusting in a visceral, gooey way that is curiously friendly. Her large hanging chandelier-like sculpture is the piece I'm thinking of that fits the visceral-gooey description. Seeing the graceful beauty of bird shapes and candles under the gooey blackness I thought of both the Adam's Family comedy (the chandelier would be great over the Adam's table) and the havoc left behind by the Exxon Valdez. I appreciate the emotional resonance of that piece -- it was quite beautiful. "Through a physically demanding process of slicing, twisting and weaving found rubber (primarily from bikes, cars and farm equipment), she forms dynamic, whimsical sculptures that fuse ecological concerns with questions about racial, and economic differences, globalization, and existing sociopolitical power structures." I love buying food directly from farmers and ranchers, especially when I'm traveling. Local foods represent the culture and climate of their origin. When I meet the farmers and ranchers and buy their products I feel a better understanding for the area AND I get some really great food. It's a win - win! I spent the past 2 weeks traveling and want to share with you my 2 favorite food stops on the I-5 freeway in Northern California. The Olive Pit and Heath Ranch. 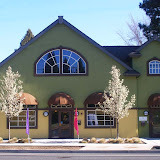 The Olive Pit in Corning, California (north of Redding, CA) is a 40+ year old family owned enterprise selling all things olive along with touristy gifts including jams, candy and nuts. You aren't meeting any farmers, but you can buy local olives and nuts. Sited in a old Denny's type of building, it's not a visually interesting store, though it is clean and neat. Order an ice cream or hamburger at the snack cafe, enjoy the very clean restrooms and a huge parking lot with RV spaces. Ask and the staff will show you the local olives and products, including organic olives and organic olive oils. There is also a selection of imported olive products. My favorite product is the Olive Muffuleta, an Italian style olive salad that includes bits of cauliflower, carrot, garlic, capers, peppers, onions and spices. It comes packed in either brine or olive oil (my favorite). Pour the Olive oil packed Muffuleta on pasta for an instant head-start on a pasta salad or hot entre. You can order online from them if you aren't up for a drive. Heath Ranch (south of the Olive Pit). 4814 County Road 99w, Orla nd, CA. 530-865-3472. This is a small ranch owned by Ron and Melanie Heath. From the barn behind their home the Heaths sell organic olive oil, oranges, local honey and whatever else they or their neighbors might be growing that time of year. This is a very small operation -- they don't have bathrooms (they do offer a porta-potty) or air-conditioning. They do have DELICIOUS homemade olives, fresh olive oil, oranges and honey that is well-priced. They don't have a website. Here's how to get there: From I-5 take Road 7 exit #671. Go East on Road 7 to Hwy 99w. Go South on Hwy 99W - 200 yards. My grandmother, Catalina Ortiz Acosta, was a strong proponent of olive oil. Despite living alone, she bought olive oil in a 2 liter can (and would use them up regularly). I love to dip my fresh artisan bread into the oil. If you're not up to baking your own loaves buy a good artisan bakery loaf.